Call me ‘sad’ but over the last few weeks I have been trawling through recent Ofsted inspection reports, to get a flavour of the ‘themes’ of the moment. I was not surprised to see, under ‘Leadership amd Management’, in all cases a reference to the effectiveness (or not) of the provider’s observation process in improving the quality of teaching, learning and assessment. Even in the twenty or so inspection reports I looked at there seemed to be extremes. Some providers had introduced some very effective strategies for improving teaching and learning through observations and professional development but there were some that have not. 1)The quality of the completed observation report including the need to focus on the extent to which learners make progress in lessons through developing skills, knowledge and a deeper understanding of a topic. 2)A provider’s observation process and how it is utilised to improve the quality of teaching and learning. 1. � Regular and insightful informed observations of teaching and learning not being done. 2. � Observations not leading to approriate, regularly monitored actions plans for staff development, supported by informed coaching and development activity. 3. � The observation process not being sufficiently focused on the impact of learning. · � to identify those areas of provision at risk and needing to be prioritised. 5. � Observation outcomes not being linked to performance management and appraisals. Matthew Coffey, Ofsted’s Director of Further Education and Skills has stated that it is not an Ofsted requirement that providers carry out graded observations. However he clarifies this by stating that what inspectors will be seeking is evidence a provider has to demonstrate they understand the performance of their staff so that they can better target CPD. It would seem from inspection comments (examples below) that some inspectors, along with many other educational professionals, consider graded observation can be significant, when focused on developing and supporting staff. Management control is essential and that means having at your ‘finger tips’ knowledge of the quality of teaching, learning and assessment in order to focus clearly on areas for improvement. To get this information in a timely manner needs a shared resource, accessible 24/7 and with reports available at the click of a button. This is not the case when completed observation forms are stored in a file (maybe at different sites), and different members of staff are working on different spreadsheets e.g. grades, actions plan etc. 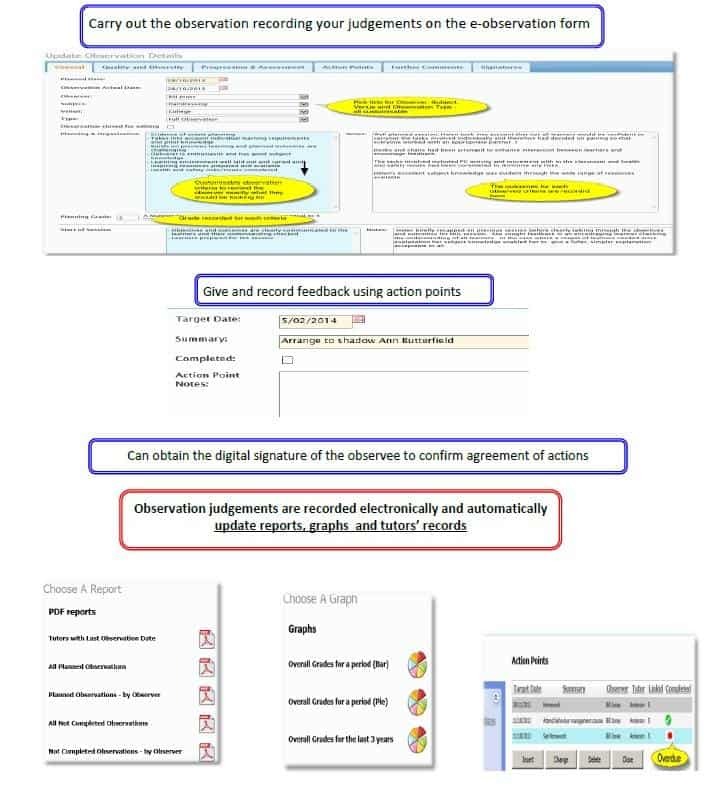 To illustrate this point click here to see a comparison between using a paper based/excel system and an electronic system. The program is so easy to use that there is no downtime needed for onsite training – because we supply online tutorial videos explaining each step. You could be up and running within 30 minutes. We have such confidence in the program we are offering the following guarantee. 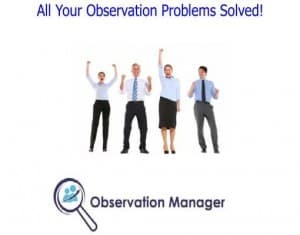 If within 60 days of purchasing Observation Manager you find it does not function as we stated then we will give you a full refund.